It has a nautical theme to it..funny how I grew up 10 miles from the beach and hated it, but now I am drawn to all things pertaining to the sea...crab guys, mermaids, seafood....hmmm?? Go figure? Well, here it is all painted and finished, our shade for the BBQ area. I painted our old patio to match the new one. I still need to paint some green on the fence and under the eaves but I am really tired of painting! I will take a break this week and finish up this weekend! My little piece of Paradise! Get out and enjoy some sunshine!! I had a pattern to make one of Tanya's fabulous purses, I have not sewed in years and was not too sure I could do this, but her pattern was very easy to follow and I think it came out pretty good! When I saw this fabric I knew I had to make a purse for Christy (my sister) She is a Vet Tech and dog lover in California, I have 3 purses from Tanya so I figured Christy needed one too! It is really hard to find dog or cat fabric that is not all cutesy and cartooney, so I found this fabric and went for it! I had to quilt around each dog! I put lots of pockets inside! I love the button, I chose! I really like it and hope she will too!! It was a fun process to sew again! May have to try it again! Well, we all know how excited I get when the first day of summer arrives! It will be here next Tuesday! 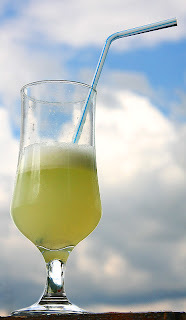 So, I decided to change the colors on my blog to more of a summery feel! I think of blue skies and lemonade in summer! So I think my blog reflects that now! I will be hard at work this weekend and will have photos of the backyard to show off! 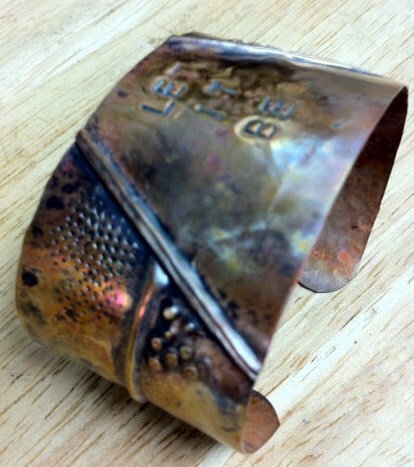 Here is the cuff I made in class yesterday...Lots of folds and texture! I love the process of making copper jewelry, it is so much fun to bend and shape the metal..it starts as a bright flat peice of shiny copper and by the time you get done, it is turned in to a work of art! 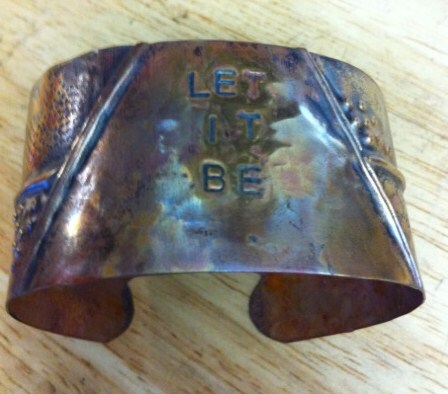 I never liked the Beatles music, well, until Colleen (my friend and jewelry teacher!) took me to see the Love show here in Vegas, if you come to town make sure you see that show! They did the music so wonderfully that it made me an instant fan! But the version I like best of "Let it Be" is Kris Allen's version from American Idol, so beautiful and haunting! Been working on painting the backyard, I will have to work about 2 hours each morning due to the heat..7-9 is good then shower and off to work. I can't wait until it is all finished back there, the new patio cover, the brick enclosure, more garden decor! I will post photos when I am done! I put a new recipe on the cooking blog (Italian beef sandwiches) and if you are looking to have a great summer dessert check out Mandy's blog at AWhimsicalFleaMarket, it is fabulous! I just made some to take to my copper cuff class I am taking today! See you back here later for more fun in the sun! ﻿22 years ago, charlie, john, debbie and I drove up to Lake Tahoe so charlie and I could get married! We had a fun time and it was a beautiful ceremony, although I was so nervous I do not remember a thing! It was "you take care of me, and I will take care of you". Every marriage has problems and "speed bumps" as we call them, but we always go back to "our promise". and we always stay affectionate, hold hands, kiss, etc. we know never to get serious and hurt each others feelings. but we learned to enjoy the ride no matter what! I hope we make it to Hawaii in 3 more years! 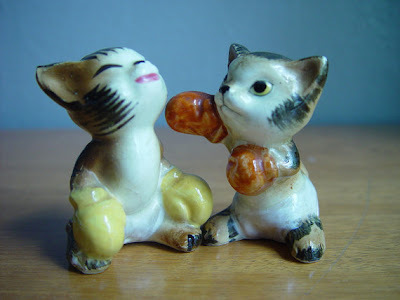 I like to surf the internet for vintage kitchen items,...Once I saw this little set of salt and pepper shakers on etsy, I knew I had to have them for my kitchen shelves!! Oh, how dang adorable are these two? Duking it out for a place on the table???? I could not resist!! They now have a happy little home on a shelf in my vintage kitchen! 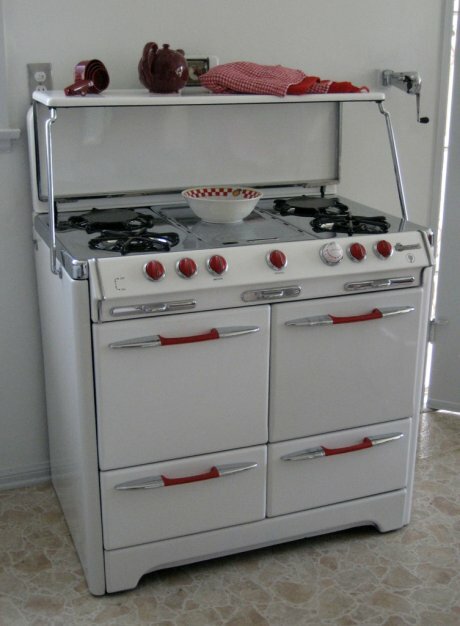 Someday I hope to hit a jackpot big enough to get me a vintage stove so I can have a "real" vintage kitchen...can you see me making pancakes on sunday morning on this.....I sure can! !